The book of Revelation is not just about Apocalypse or Anti-Christ or any other event, but rather it is ultimately about the Revelation of Jesus Christ as a person to the Church and then to the world and its system of governance. 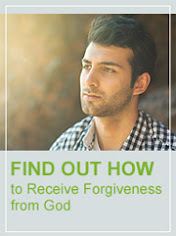 First part of the Book is the revelation of Jesus Christ about who He is [i.e. the Savior and Judge] in relation to the Church His Body and the next part is what He is in essence to the world [i.e. the righteous Judge who is God]. In this Book the person of Jesus Christ is revealed more and more as the present world system gets deteriorated to become extinct forever. All His servants must have a good understanding about this Book of Revelation because it carries a special blessing along with it (Rev 1:1, 3). Mainly all of the Book of Revelation that which Jesus had sent to us by His angel to understand is signified (1:1). In other words it is in sign language signifying or giving us the truth concealed in it. All these things Jesus has revealed to us to make us understand that He is in control of all these event when these must shortly take place (1:1). 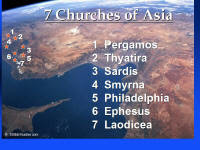 The first messages that Jesus gave were the messages to the seven Churches which were in Asia. These were the Churches which were established by the Apostles of John’s time. John himself was one among them as more of a Prophetic Apostle. Here we should understand that these Churches were actually Churches present in the natural during John’s time which Jesus signified [used as a sign] to bring a message to the Church of all time. Church of all time represents the Church which was established at the time of Pentecost through the Apostles, up to the time the Church will be raptured from this planet earth as the Church with out spot and blemish as ministered through the Apostles of End Time (Galatians 2:8-9; 1:18-19; 2 Cor 12:11-13; Eph 4:13; 5:26-27; Luke 11:49-51; Rev 18:20, 24). These each Churches in Table 1.1 represents various time periods that the Church went through and is still going, up to the rapture in the nearer future. The Church of Jesus Christ will be there until the kingdom gets established on earth at His second coming. But the truth about the rapture is, those who obeyed Him and kept watching for Him before the tribulation period begins will be rewarded with rapture because of their obedience in watching out for Him. Others because of their disobedience and lukewarmness will go through tribulation (Daniel 11:31-35). This will be refining process for those lukewarm believers. We need to refer the Book of Daniel to indicate all the details about the End Time because Jesus Himself did that and said, “...whoever reads [the Book of Daniel], let Him understand.” (Matt 24:15), when He spoke about the End-Time events in the Gospels. He expects us to read the Book of Daniel and understand it. When Jesus spoke this, the Book of Matthew was still not written, so it implies that He spoke about the Book of Daniel in this Verse of the Book of Matthew. Ad 96 to 3rd Century A.D.
3rd to 5th Century includes Persecution [A.D. 303 to 313]. Early Heresies [5th to 7th Century A.D]. Jezebel in the Church [8th to 13th Century]. 1517 A.D – The Rapture [The open door]. Rapture – Kingdom rule on earth [Kingdom establishment]. In all the apostolic doctrines, right from our Lord Jesus Christ who is our Chief Apostle to the present time, they will always interpret Scripture through another Scripture and will give the collection [Word-Collections] of it as doctrine to understand and follow. Even logical reasoning will be done only based on the Scripture and not apart from it. The canon of the Scripture has been closed with the Book of Revelation as the Last of it, no more to add or take away out of it (Rev 22:18-19). But the cutting edge teaching that the apostles teaches for the application and understanding of the Scripture in real life are from the Canonized Scripture through revelation from God about the Scripture, not apart from it (Eph 1:17-18; Luke 24:32, 45; Acts 2:42). Up to the time of rapture Jesus directly only rules [governs] over His Church [i.e. now in the Present time]. Now in the present age of grace the Lord Jesus has appointed the Church to rule the world and reign in it through His power (Matt 28:18-20; Rom 5:17; 16:20). Once the rapture happens, from that moment Jesus will also take over the government of the world system [from the heavenlies (i.e. the air of first heaven)(Rev 12:7-10; Luke 21:26), because moments before the rapture happens Satan already would have been thrown to the earth, this is the reason the saints will be meeting Him in the air because by then the prince of the power of air would have been thrown down or dislodged from his position of power (1 Thess 4:17; Eph 2:2)]. The revelation of Jesus Christ from the time of His resurrection to the time he will visibly appear to the Church on the day of rapture is excusive to the Church only (John 14:19; 16:16-17; Rev 1-3; Acts 1:1-3; 2 Peter 1:16-21; Acts 22:9; Matt 17:1, 8-9). The revelation of Jesus Christ through all the signs of the end time to the world will start from the day of rapture of the Church even up to to His second coming. But on the day of His second coming all the signs will culminate with a visible manifestation of Jesus Christ to all the tribes of the earth and they [i.e. the people on earth at that time] will need no further revelation to identify Him at His second coming and will mourn Him (2 Thess 1:6, 7; I John 3:2, 3; Heb 9:28; Luke 17:30; Acts 1:9, 11; 1 Thess 4:17; Zech 12:10; Matt 24:29-31 ). On the day of rapture, the saints need the revelation of the Son of man to be caught up in the clouds (1 Thess 4:16-17; Luke 17:24, 37). So only this day is called the day [not days] of the revelation of the Son of man (Luke 17:30). The days of the Son of man will be the days preceding the rapture of the Church in which His people will become lukewarm like what happened in the days of Noah (Luke 17:25-27). The same also happened in the days of Lot also (Luke 17:28-30), until all [lukewarm believers and unbelievers] were caught up in the destruction and Judgment from the Lord and were swept away. The judgment of the world from the day of rapture is shown on the Book of Revelation by Jesus as the one and only Lamb of God opening the seals of Judgment which were stored for the End-Time because of His Grace that came upon every man to repent from the day of Calvary to the present time (Luke 24:46-49; Rev 5:1-7, 8-10 [new song about reigning in the earth], 11-13 [blessing, honor, glory and power was given to lamb for ever and ever]). Now from here on the government of the Lamb rules the world, and it is shown by the Lamb opening the seals of Judgment which comes upon the earth by His choice (Rev 6:1). Scriptures on the Rapture: Christ’s Coming FOR the Saints. Scriptures on the Second Coming: Christ’s Coming WITH the Saints. Pray always, that ye may be accounted worthy to escape all these things….and to stand before the Son of man (Luke 21:36). One like the Son of man came with the clouds of heaven, and came to the Ancient of days, and they brought Him near before Him. And there was given Him dominion, and glory, and a kingdom, that all people, nations, and languages shall serve Him (Dan 2:44-45; 7:13-14; 18, 27). In My Father’s house are many mansions….I go to prepare a place for you….I will come again, and receive you unto Myself; that where I am, there ye may be also (John 14:1-3). Then shall the Lord go forth, and fight against those nations….His feet shall stand in that day upon the mount of Olives, which….shall cleave in the midst thereof toward the east and toward the west…the Lord my God shall come, and all the saints with Thee (Zech 14:1-5, 9, 16-21). Christ loved the church….that He might present it to Himself (Eph 5:25-27). Immediately after the tribulation….then shall all the tribes of the earth mourn, and they shall see the Son of man coming in the clouds of heaven with power and great glory (Matt 24:29-31). From whence [heaven] also we look for…Jesus Christ: Who shall change our vile body (Phil 3:11, 20-21; 2 Cor 5:1-9). When the Son of man shall come in His glory, and all the holy angels with Him, then shall He sit upon the throne His glory. And before Him shall be gathered all the nations (Matt 25:31-46). For the Lord Himself shall descend from heaven…the dead in Christ shall rise first: Then we which are alive and remain shall be caught up together with them in the clouds, to meet the Lord in the air [not on earth, to go back to heaven with Him] (1 Thess 4:13-18; 2:19; 3:13; 5:9, 23). When the Lord shall be revealed from heaven with His mighty angels. In the flaming fire taking vengeance on them that know not God (2 Thess 1:7-10; 2:8). We beseech you…by our gathering together unto Him…until He be taken out of the way (2 Thess 2:1, 7-8). The Lord cometh with ten thousands of His saints, to execute judgment upon all…that are ungodly (Jude 14-15). When Christ….shall appear, then shall ye also appear with Him in glory (Col 3:4; 1 John 2:28; 3:2; 1 Peter 5:4). He cometh with clouds; and every eye shall see Him…all kindred’s of the earth shall wail because of Him…the armies of heaven followed Him upon white horses (Rev 1:7; See 19:11-21; 20:1-3; Isa 63:1-6; Joel 3). The verses in James 5:7-8 speaks about the rapture by saying, “Be patient…unto the coming of the Lord…until He receive the early and latter rain” and it tells that Jesus is waiting to pour out His Spirit fully upon His church before the rapture takes place, to make it a glorious church with out spot or wrinkle so that she should be holy and with out blemish (Eph 5:27). This is when we all [the universal church] will come to the unity of the faith and of the knowledge of the Son of God, to a perfect man, to the measure of the stature of the fullness of Christ (Eph 4:13). The verses in 1 Cor 15:51-56 says, “We shall not all sleep [die physically], but we shall all be changed [here all emphasizes that nobody will be left after this first resurrection (Rev 20:4-6)]. In a moment…at the last trump…the dead shall be raised incorruptible, and we [the living saints in Christ who died during the tribulation period even upto the second coming of Christ] shall be changed…put on immortality…then…death is swallowed in victory”. Here we see that the Scripture speaks about the resurrection that will happen for the believers at the second coming of Christ to the earth, because it says this resurrection will happen at the last trump which is the seventh trumpet that is indicated in the Book of revelation as the last trumpet just before Jesus comes to the earth (Rev 11:15-19). The faithful church of Philadelphia [i.e. the church that is present during the time period before rapture takes place] is promised with the rapture by Jesus saying, “…I…will keep you from the hour of trial which shall come upon the whole world, to test those who dwell on the earth.” (Rev 3:10). 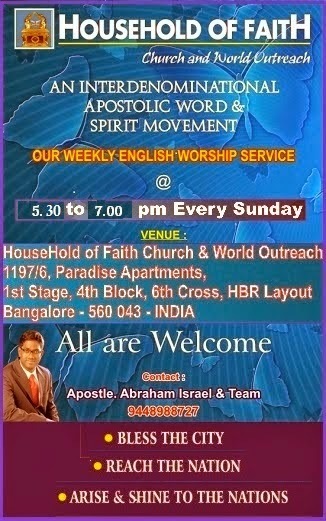 This is the church that will bring the fullness of the gospel to the whole world by proclaiming it inspite of opposition and difficulties. This ministry Jesus symbolically identified as ‘opening through the key of David [mercies of God]’ the door of blessing to the world (Rev 3:7). Jesus assured this church that it is He who opens the door for the work of the ministry and no one can shut throughout this period of time (Rev 3:7; Col 4:3; 2 Cor 2:12; 1 Cor 16:9; Acts14:27; 19:8, 9). This ministry He also identifies as works that has been done in His name by keeping His Word. This work of ministry will be completely done in the strength of the Lord. Identifying with His name and keeping His Word will always bring the power of the king and His kingdom behind us (Rev 3:8; Mark 9:38-41; Eccl 8:4). There will also be a rise in Jewish false religion which Satan will propagate saying to the true believers that they [i.e. the Jewish believers] are the real people of God. But Jesus has promised that He will make them realize their folly by His awesome display of power through the Church. After the rapture takes place, there will be a sudden surge in the one world Babylonian religion of the Harlot. The believers who were left behind due to lukewarmness will be tempted by this religion to join it because of severe persecution for true believers. But whoever seeks the Lord in desperation knowing the reality of the false religion, will become spiritually rich and will be refined as gold in the fire of tribulation and will wear pure white garments [symbol of purity by rejection of the impure false religion]. They will be clothed and will not be naked [by being blind to Spiritual reality]. They will see the reality of the false religion. In this time period of tribulation which has been signified by the church of Laodicea is a very short period of time before the second coming of Jesus Christ to this earth. Those people who overcome these things will enter directly in to His millennial kingdom and even if they die will rise up in the first resurrection when Jesus comes back to the earth (Rev 3:14-22; 6:9-11; 7:13-17; 18:4, 5; 20:4-6). 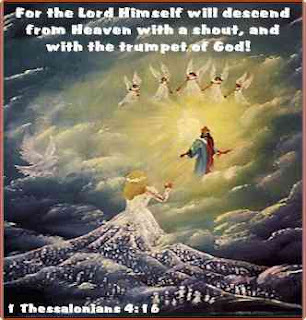 The seventh Trumpet will be the last trumpet of His coming (Rev 11:15-19; Dan 12:1-3, 6-7, 10-13; 1 Cor 15:52). The seventh trumpet will be the time when Jesus who has taken His power back at the time of opening the seals by taking the scroll, will literally establish His power on earth by destroying those who destroy the earth (Rev 11:15-19). The great Babylon is the political world system that ruled the whole world up to the time of Armageddon and is different from Babylon the Great (Rev 16:19; 18:2). Praise the Lord!